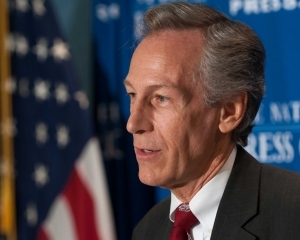 Virgil Goode, Constitution Party candidate for the presidency, discusses his platform at a National Press Club Newsmaker news conference, October 12, 2012. Mr. Goode started his political career in the democratic party; became an independent in 2000, a republican in 2002, and following his failed reelection bid to Congress in 2008, aligned with the Constitution party. “We have an uphill battle, but I am optimistic that we will have a strong showing” in the coming election, Virgil Goode, the Constitution Party’s nominee for president, told reporters at a National Press Club Newsmaker on Oct. 12. Whereas Gov. Mitt Romney and President Barack Obama have based their plans for job growth largely around a combination of tax cuts and stimulus, Goode puts immigration front-and-center in his jobs plan. “Jobs in America, when you’ve got high unemployment, should go first to U.S. citizens,” said Goode. Though his may not be a household name outside of his native Virginia, Goode believes that “if the American public wakes up”, his proposals for a moratorium on permanent-resident green cards IDs and a limit on congressional terms will resonate with those listening. Goode represented Virginia’s 5th District in Congress for 12 years in various incarnations. He began as a Democrat, changed to an Independent, and was a Republican when he left Congress. Now he represents a sizable third party that could be a factor in the battle for Virginia’s 13 electoral votes. The candidate shrugged off suggestions that he might cause Romney to lose Virginia, saying that bringing his core policy concerns to the fore of American politics is what mattered most to him. “What’s more important than who’s president is: Are we going to balance the budget now? Are we going to have jobs in America for American citizens first?” he emphasized. Goode’s threat to Romney in Virginia is real –- a recent poll had 12% of Virginians favoring Goode and his running mate Pennsylvania lawyer Jim Clymer and mentioned Wyoming and Nevada as two other states where he commands significant support. One issue on which Goode agrees with a major presidential candidate is healthcare. Goode echoed Romney’s call to repeal Obama’s signature healthcare legislation because of the alleged cost the law imposes on small businesses. Throughout the Newsmaker, Goode hammered home his four policy priorities: end illegal immigration; balance the budget, set term limits for members of Congress, and abolish Political Action Committees, the fundraising groups driving presidential election spending to record highs. On this last issue, Goode has matched word with deed by limiting donations to his campaign to $200. He estimated that of the approximately $200,000 raised by his campaign to date, $65,000-70,000 was out of his own pocket.